David Willey says it is a real honour to have eclipsed Brendan McCullum to claim the fastest ton of the T20 season so far. 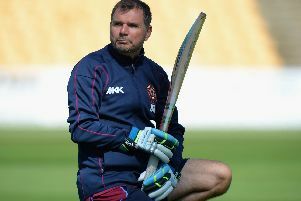 The Northants Steelbacks all-rounder smashed a stunning 100 from just 40 balls to secure a seven-wicket win at Sussex Sharks and book a finals day place at Edgbaston on August 29. It was the joint eighth fastest hundred in the history of 20-over cricket and saw him join a pantheon of greats. One of those is New Zealand star McCullum, who had previously hit this season’s fastest T20 century, in a game against Worcestershire. And Willey said: “He’s alright isn’t he so to be in the same bracket as someone like him is a real honour. “The guys know my game quite well and they know that if I stand still and give myself a chance the boundaries aren’t always big enough. “When I get going I just try to keep going and hope that it’s my night really. “I started quite slowly, didn’t really pick up the pace of the wicket. And Willey’s heroics weren’t limited to batting as he had earlier took three wickets for 27 runs to help restrict Sussex to 165 for seven. He got the Steelbacks off to a perfect start by dismissing Sharks skipper Luke Wright for a duck, with Olly Stone taking a fine catch. “It was nice to get him out because he’s got a lot of runs in this competition,” Willey said. “Stoney said to me just before I started that run that he’d get a catch so Stoney knows what he’s talking about obviously. “They were batting exceptionally well after that, manipulating the fielders and scoring freely. “It looked like we could be staring down the barrel with 200 runs plus. “They were going very well with the bat and a fantastic catch from Cobby (to dismiss Mahela Jayawardene) swung momentum. “Then we managed to get going with the bat and carry that through. Willey was the star of the show when the Steelbacks won the T20 competition at Edgbaston two years ago, taking a hat-trick in the final against Surrey. And he is now looking forward to returning the venue for another tilt at the trophy. “Finals day, we won it two years ago, we’ve got a great group of players,” Willey said.